OR Tambo Airport (JNB) leaves much to be desired. As the main international gateway to southern Africa, the airport should at least provide some basic comforts. Things it’s missing include decent air conditioning, practical signage, genuine copies of Microsoft Windows, and basic queue management. 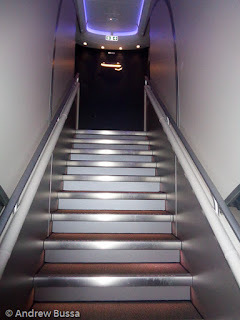 It does have an observation room (good idea) upstairs (bad idea) and down a winding administrative hallway. The duty free shopping was spectacular because the booze prices were ridiculously low. My flight from Cape Town landed on time and I retrieved my checked bag (bags weren’t making connections due to a strike) and went for a 15 minute walk to the British Airways (UK) check in counter. It was closed. To kill time I took a stroll to the observation deck. There was little to see, so I went back to the check in desks and read a book while sitting in front of the first class check in counter. Check in starts 3 hours before the first departure, not a minute sooner despite staff being present. Check in didn’t take long and the trip through security and customs wasn’t terrible (it’s a zoo in the evening). After my disappointing lunch on my flight to JNB, I went directly to the BA first class lounge for a proper meal. I was one of 5 people there and found a nice seat with an outlet and view of the terminal (only view offered). I grabbed a Scotch and some cold cuts. The hot food buffet didn’t look appetizing. I wound up being hungry enough to not mind snacking and Castle Lager. As departure neared, the lounge filled up. 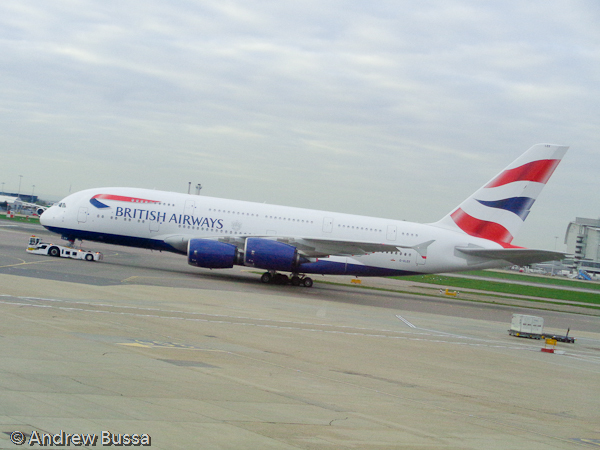 Really, there were 28 first class seats on BA flights that day and there were easily 60+ people in the small space. There were 5 open seats and 0 open outlets when I left for a stroll. The business class lounge was standing room only and a mess. The customs line seemed more relaxing. This ground experience was not up to Lufthansa standards. 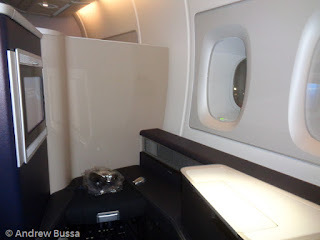 My trip in 2013 on Lufthansa is my only time on a proper international first class. They set the bar very very high. From arrival at the airport through baggage claim, the experience is superb. 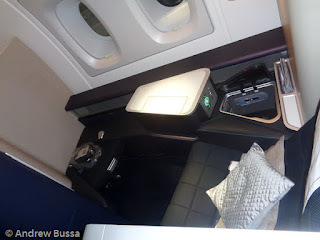 BA could still win me over because I was booked on an 11 hour A380 flight with a connection at their new Heathrow terminal. BA’s A380 first class cabin is massive. 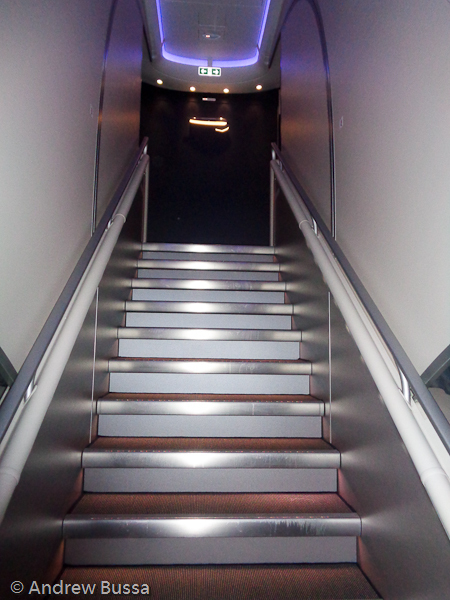 Other airlines fit 52 economy seats it the lower deck between doors 1 and 2. 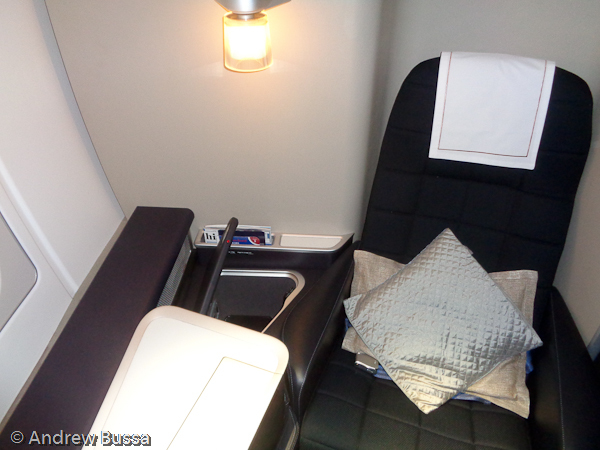 British Airways only accommodates 14 first class seats in the same area. The personal space is wonderful and there is a strong sense of privacy. There is also ample storage space with a personal closet and overhead bins. I was offered Champagne after storing my stuff then presented with a pajama set and amenity kit. I settled in and started to familiarize myself with the gadgets. Power window shades, large tv, the seat adjustment knob (it was milled aluminum and felt great to touch), and on and on. I was in for a treat. The captain’s welcome about announcement mentioned that our aircraft was two months old. Soon after the lead flight attendant came by to welcome me, give an introduction to the service plan, and ask if there was anything special I might require on the journey. I was excited and ready to take it all in. The drink service started right after takeoff. I went with Johnnie Walker Blue. First class passengers can dine when they wish. I wanted to dine as soon after takeoff to maximize my sleep. The service and food were great. I also enjoyed listening to A History of English Speaking Peoples over dinner. My flight was oozing of British-ness. I easily slept for 7 hours after the meal service. I enjoyed the English breakfast before landing and was sad my flight was ending. It was an outstanding flight with a great onboard product. Heathrow Airport Needs to Advertise?